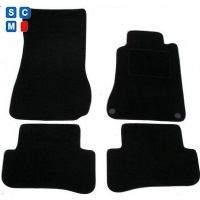 "Mercedes-Benz C-Class Coupe Car Mats"
FULLY fitted Car Mats are designed specifically for your Mercedes C Class Coupe, to fit the shape of your foot wells. Mercedes C Class Coupe 2000 - 2008 (W203) Fitted Car Floor Mats scores 4.6 out of 5 based on 19 ratings. The mats are as expected and fitting perfectly, I'm happy with them and really like the end product. Well done. Fit correctly and look very smart. Very pleased. mats are very good they fit the car perfect colour match is spot on for interior and embroidary logo is same colour as paintwork just the job. Bought the personalised mats as a present and they look great.First class service. Very good quality, my father was very impressed with them as are everyone he keeps showing them off to. A good product, quality as expected and much better value than Mercedes own product. Mats fitted perfectly - very happy with my purchase.